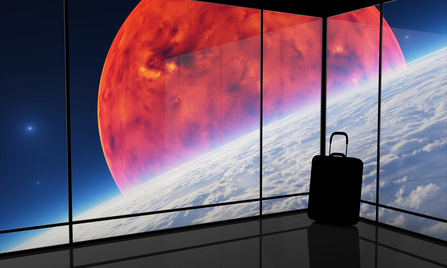 Systematics » Design » Designing Commercial Spacecraft: Carry-On Bags Permitted? In some ways, today’s interplanetary travel resembles airline travel: uncomfortable seats, bland food, and very limited storage space. As a manned Mars mission approaches reality and commercial space ventures push the envelope of tourism, Boeing has partnered with NASA to design less spartan spacecraft interiors. LED screens are substituted for windows and a blue lighting scheme creates a calm, pleasant atmosphere. Cargo storage too is a vital consideration; seating can be reconfigured into storage, much like modular reconfigurable storage systems here on planet Earth. Passenger-oriented design will certainly make the 2-year trip to Mars relatively comfortable. SpaceNews.com discusses Boeing’s plans in detail here: http://bit.ly/1qmsC1f. While industrial designers at Boeing are working on spacecraft interiors, perhaps they will figure out a way to increase the overhead storage capacity in today’s airplanes!